This sweet little hen Cecily gets a prosthetic leg via 3D image printing technology. A 3D copy of her good leg is made that can be used to make her new prosthetic leg.Cecily was born with a torn tendon which could be attributed to a genetic defect that caused her foot and leg to twist around making it uncomfortable and difficult for her to walk. Her devoted owner took her to a vet that gave her two options. Put Cecily down or get her a prosthetic leg. Cecily's owners found a woman to adopt her and the Martin's who own a rescue sanctuary will pay part of the cost of the surgery. Surgeons at Cummings Veterinary School at Tufts in Massachusetts will do the procedure using 3D printing technology. A 3D copy of her good leg is made that can be used as a pattern to make her new prosthetic leg. (CBS News). "GRAFTON, Mass. 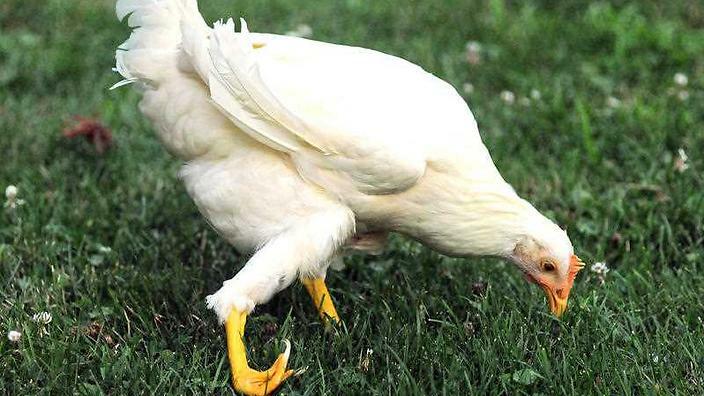 (August 6, 2015)— Clinicians at Cummings School of Veterinary Medicine at Tufts University report that Cicely, a five month old chicken, is in stable condition after undergoing surgery on the morning of Wednesday, August 5, to partially amputate a bone which was causing Cicely’s right leg to bend in the wrong direction. The Cummings School’s surgical team, led by Clinical Assistant Professor Emi Knafo, who has a special interest in avian orthopedics, reports that the young chicken is doing well but has a long way to go. During the surgery, while Cicely was under general anesthesia, the Cummings team made a copy of her good foot via CT scan. That scan will enable personnel at Tufts’ School of Engineering to create a 3D-printed, plastic prosthetic that will be put on later this month. Veterinarians and engineers will collaborate to ensure that the final design is as comfortable and mechanically useful as possible, using materials with different strength and flexibility combinations".